The owners of the fabled Nickelodeon Theater and Del Mar Theater in downtown Santa Cruz also have the good taste to own the Aptos Cinema in the Rancho del Mar Shopping Center. 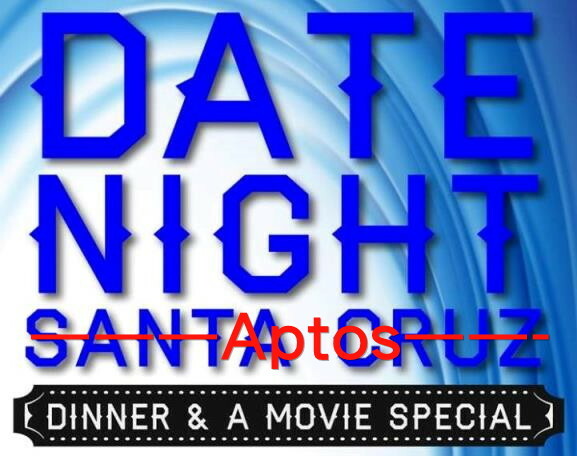 They have partnered with a number of local restaurants to create Date Night Santa Cruz, which is a Dinner and Movie Special. For just $50, you can get two tickets to see a movie and dinner for two, every evening Monday through Thursday, holidays excluded. Tickets can be purchased at any participating restaurant or movie theater (including those in Santa Cruz). The cost of the dinner is limited to $50 in most cases, although some restaurants limit it to $45. The tickets can be used for most items in the restaurants, typically including starters, main entrees, desserts, and drinks. A perennial favorite in Aptos is Cafe Rio, located adjacent to Rio del Mar Beach. They feature a great outdoor patio and a wall of windows overlooking the bay. They have an extensive wine list and a full bar, and use local, farm-fresh ingredients whenever possible. Au Midi Restaurant and Bistro is considered by many to be some of the finest dining in all of Santa Cruz county. They received a 2014 “OpenTabler” Diner’s Choice award, and are ranked #2 out of 56 restaurants in Aptos by TripAdvisor. Nicholson Vineyards is Located in idyllic Pleasant Valley. They are a boutique vintner with an exclusive run of just 1,000 cases per year of hand-crafted wines, including Chardonnay, Viognier, Pinor Noir, Syrah, Zinfandel, and Cabernet Sauvignon. The wines are excellent – they won three Silver awards at the 2012 California State Fair Wine Competition, the oldest and most renown wine competition in the country. The winery has four acres of wine grapes, and another four acres of Tuscan olive trees, which they use to produce an olive oil which they also sell. They are open most Saturdays from noon to 5 PM for wine tastings. They also have a wine club for those who are interested in regularly enjoying their wines. Tip: The winery can be reserved for special events, so it’s best to check to make sure they’re open if you plan on dropping by on a Saturday. When it comes to fine dining in Aptos, Bittersweet Bistro has to be near the top of the list. Located near the Deer Park Marketplace Shopping Center, Bittersweet Bistro specializes in what they call American Bistro cuisine with Mediterranean influences. They have a full bar, and also have an extensive wine list and a rich dessert menu. Adjacent to the Bittersweet Bistro is Cafe Bittersweet, where they serve Breakfast (from 8 AM til 1 PM) and lunch (from 10 AM to 2 PM). They have also opened the Bittersweet Lounge, with leather chairs and three flat panel televisions – including a 110 inch screen! The Lounge is open 7 days a week, but on Friday and Saturday is open only for patrons 21 years and older, but all ages are welcome Sunday through Thursday. You will often find live music on the weekends, with a variety of local musicians tuning up and entertaining the crowds. Whether you are just looking for a quick cocktail and some appetizers or an unforgettable full meal, this is the spot to try in Aptos. Tip: Every day of the week they feature $7 “nightly nibbles” starting at 4 PM. 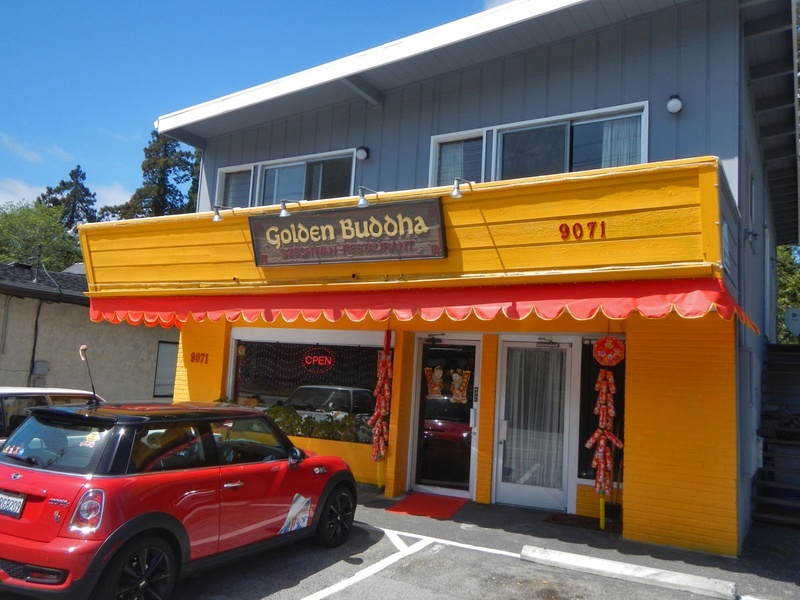 Long an icon of Soquel Village, the Golden Buddha Chinese Restaurant moved to its new Aptos location in April 2014, taking over the site of the Lucky Dragon restaurant, which closed a few months before. They have a large menu with a range of traditional Chinese dishes, with something for everyone. They also offer free delivery within a 4 mile radius of their location for orders of $25 or more – which means they’ll deliver pretty much anywhere in Aptos. They also feature the ability to order on-line from their web site – they have a pretty cool system where you can also specify how spicy you’d like each dish to be prepared. Tucked away on Pleasant Valley Road, you’ll find the Pleasant Valley Vineyards, a small family-run vineyard serving a choice selection of local varietals. As a relatively small operation, they have limited hours: only on Saturdays from noon to 5 PM, and usually only between April and September – unless you call the winery to make special arrangements. They specialize in Pinot Noir and Chardonnay estate-grown wines, and their signature Pinot earns a 91 score on CellarTracker.com. Their tasting fee runs between $10 and $15, and that’s for five pours. They also offer a wine club membership, including complimentary tastings and limited releases, and invitations to members-only events. Membership is available in Silver, Gold, and Platinum club versions. They have a Facebook group for wine club members. Tip: Be sure to check their calendar of events for special tasting days and more! Burger is another welcome addition to the Aptos restaurant scene. Burger has a prime location, right across the street from the Rancho del Mar Shopping Center on Soquel Drive. From the day they opened, the restaurant has been popular among Aptosians, for a number of reasons. You might think the reason would be their burgers – but you’d be only half right. They do have a wide selection of burgers, many of which are creatively named after celebrities (“Would you like fries with your Jello Biafra?”) and a sport number of creative toppings. They also have veggie burgers, turkey burgers, and an ahi tuna burger, and offer a good selection of sliders and sandwiches, too. The restaurant says they only use grass-fed beef, and when possible, purchase other ingredients locally. But it must be said that the food receives hit-or-miss reviews; overall, it’s usually good, but not great. Burgers aside, Burger does feature a dizzying array of beers on tap, and they also serve up a number of Belgian ales (bottled, alas). It’s the amazing selection of beer that keeps the bar packed at dinner time, with patrons casually tilting them back as they watch any of the many flat panel televisions positioned around the establishment. Aside from the burgers and brew, Burger also presents a very pretty face. 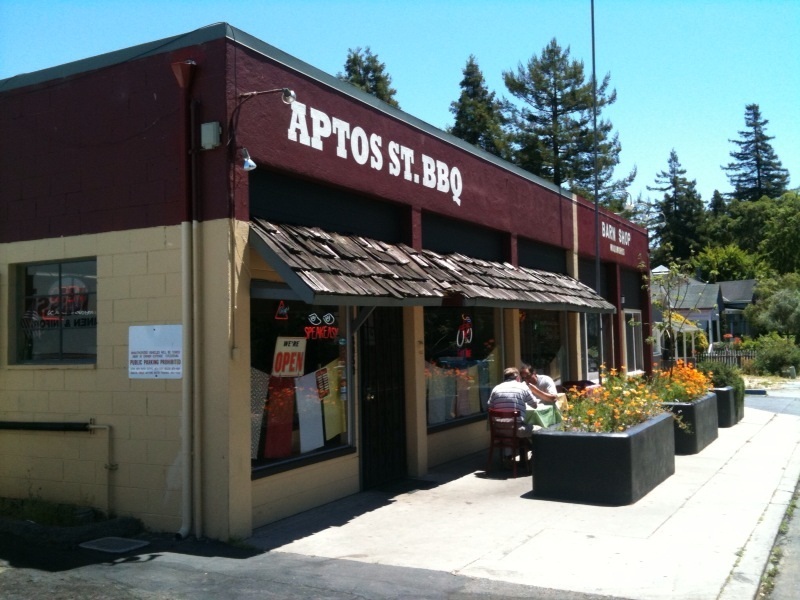 The building was completely renovated and updated, and sports a modern, chic look which is pretty eye-catching (for Aptos, anyway). They also have a large outdoor patio area, great for sunny days and the occasional warm evening. The Mediterranean Bar in Aptos has been serving patrons for over 40 years, and for much of that time, it had a well-deserved reputation as a dive bar. The bar got new ownership in 2012, and since that time, the place has moved a little upscale, right along with the rest of Seacliff. The “new” Mediteranean has been upgraded and remodeled, with five LCD flat screens complete with the NFL football package. They also feature a pool table, darts, and Internet jukebox, and you can play Kinect sports there for free. They have a decent selection of imported and draft beers, and a number of wines by the glass. They’re open 7 days a week, from 8 AM to 2 AM.